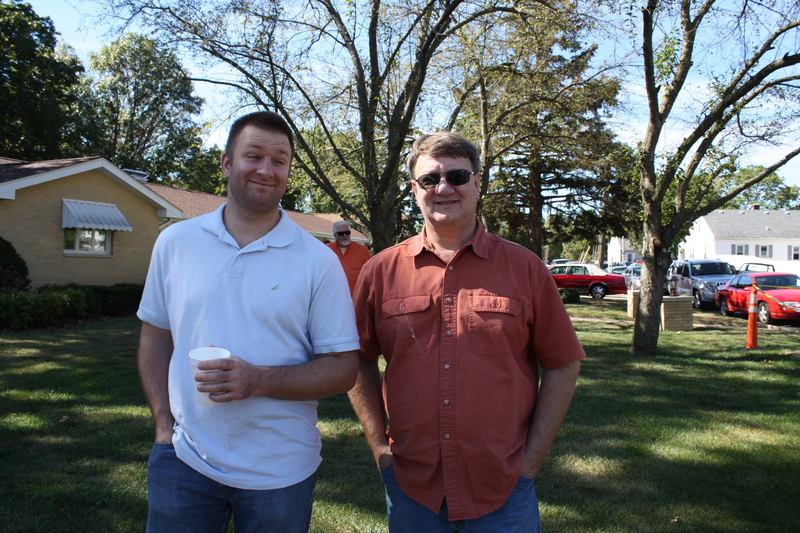 We spent this past weekend in my hometown for the annual Pumpkin Festival. The girls went to my parents on Wednesday afternoon, and then Kevin and I headed up on Friday afternoon. 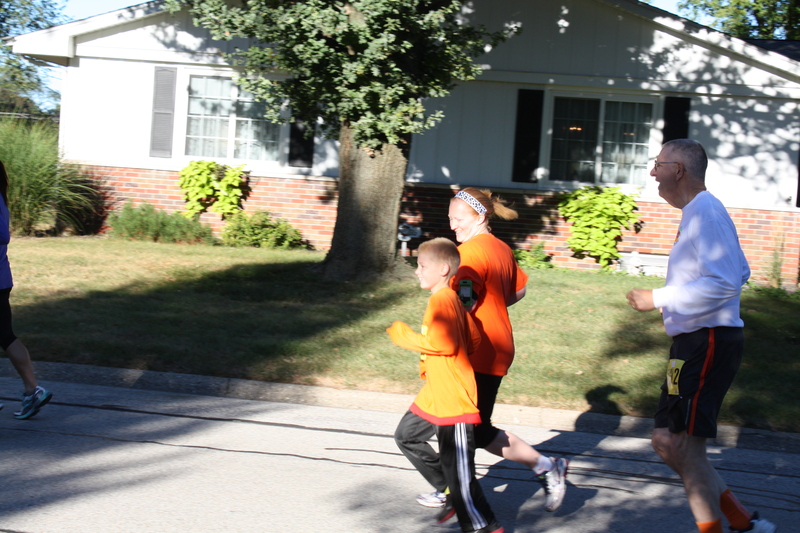 My brother, Max, and I ran the 10k on Saturday morning, while my sister and her son ran the 2 mile. Then we all headed to the parade. 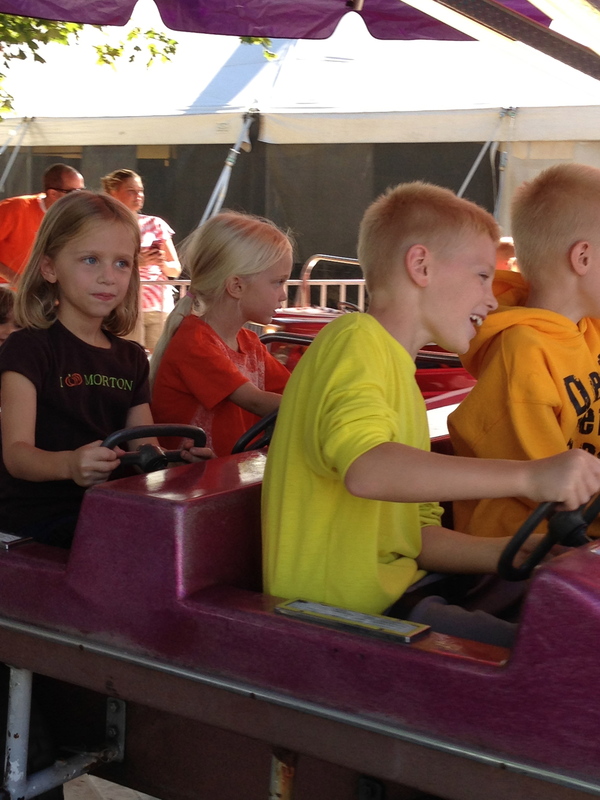 After lunch at my parents’ house, we headed down to the festival for some rides. As always, the girls had a great time. 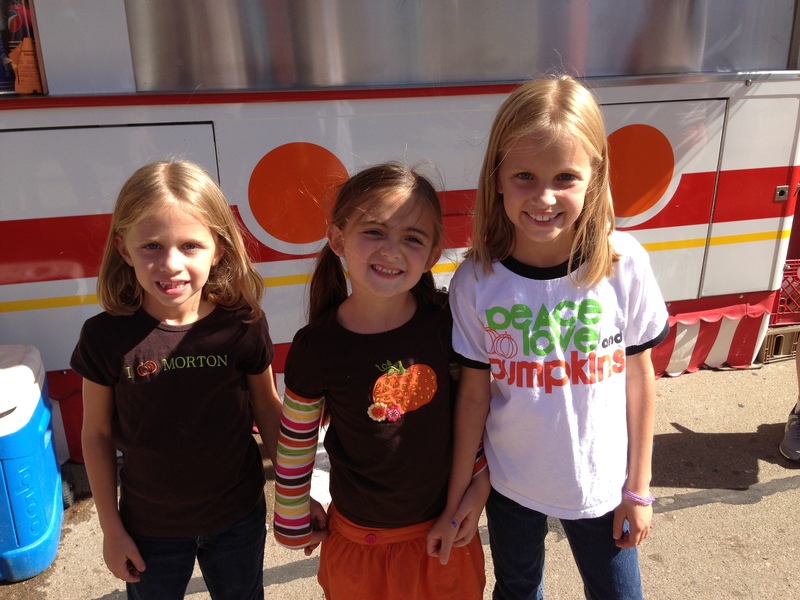 Norah said that she wishes the Pumpkin Festival happened more than once a year. 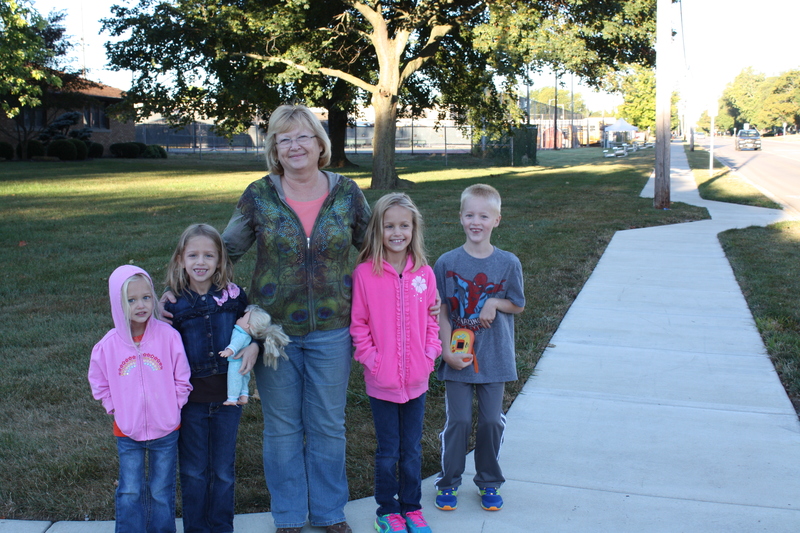 My mom and 4 of the grandkids – waiting for Alison, Ryan, Max and me to run by (the 10k goes by their street, the 2 mile goes right by their house). Alison and Ryan running by Mom and Dad’s house. This is what happens to a 4 year old after too much Pumpkin Festival fun! Ha! Daphne was one tired girl! As we headed out of town on Sunday, we ran by my cousin, Katie’s, coffee shop, Eli’s. 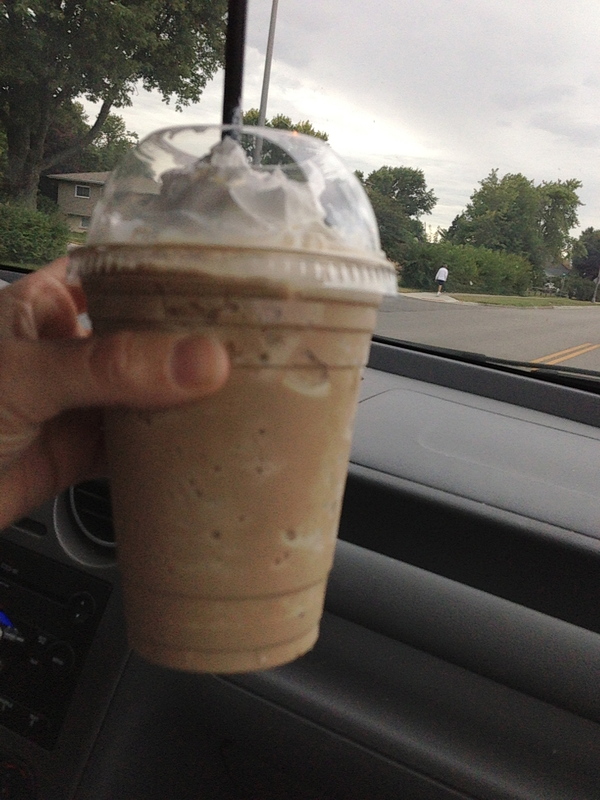 I grabbed some treats for the girls and my favorite, hazelnut and toasted marshmallow non-fat frap. YUM! As usual, we had a great weekend! The girls are already talking about next year!!! 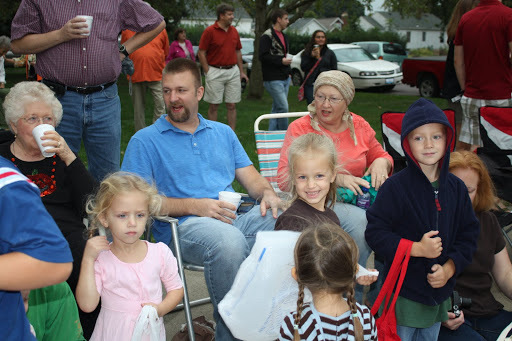 Once again we went to Morton for the annual Pumpkin Festival. Thankfully, this year it didn’t rain so we saw the whole parade. The kids walked away with more candy than is necessary for 3 kids but they were thrilled, of course. Collecting candy. Looks like Alex is already digging in!! Daphne and Alex is standing as the American flag goes by. My favorite part about P-fest is hanging out with family and catching up with friends!! My cousin’s little guy was hanging out at our usual spot while his parents were busy at Eli’s, so of course, I grabbed him as soon as I could!! I have no idea what Daphne is doing – probably praying for peace. She was a little overwhelmed with all the excitement!! My parents eventually walked her home a little earlier than the rest of us. She enjoyed a little extra attention from them!! After the parade, we headed back to my parents for lunch then we took the kids to the festival. They all rode some rides and then picked a “treat” to enjoy before heading back to my parents. All the kids – including my niece and nephews – chose cotton candy, except Lucy. She chose ice cream – a girl after my own heart! This year we we only stayed until Saturday evening. We headed home shortly after dinner so we could enjoy some time with the Morrisons – who were in STL for the weekend. 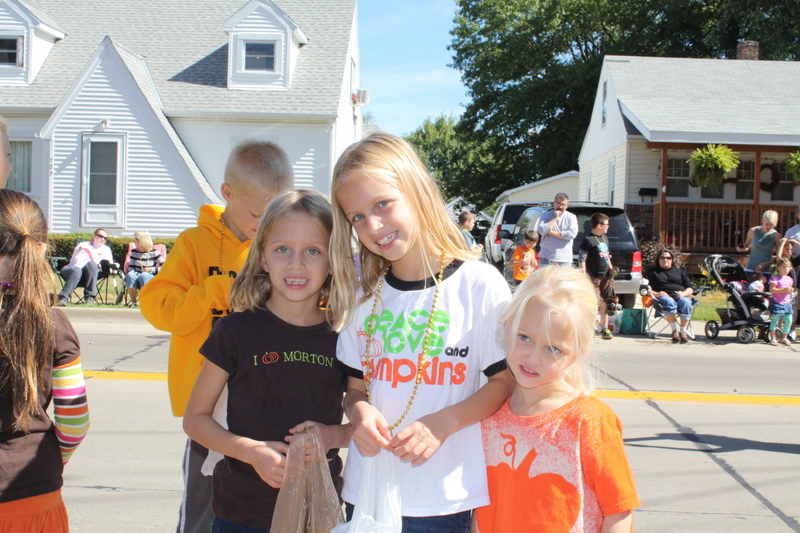 We all headed up to Morton for the annual Pumpkin Festival. It ended up being. . .an interesting weekend this year. The weather was beautiful all week and then the forecast for Saturday afternoon was rain. We weren’t sure we would make it downtown to ride rides and eat the yummy food. 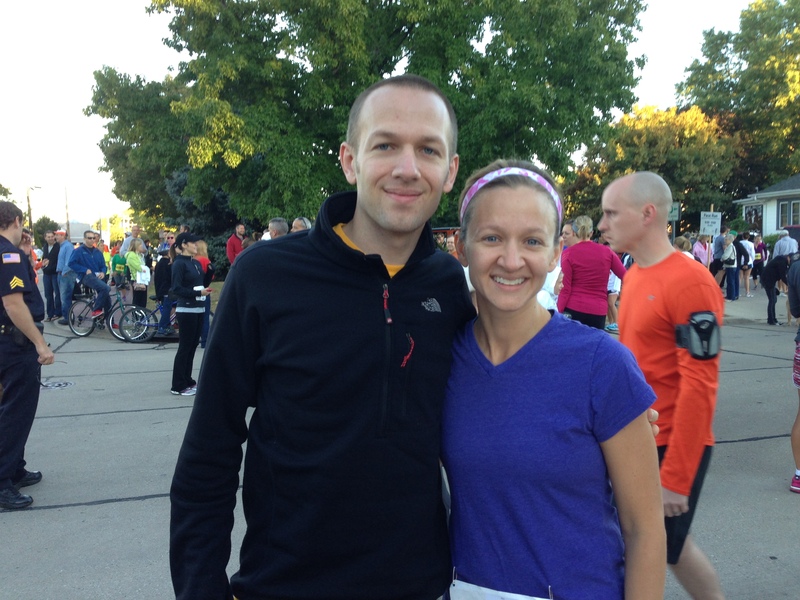 Kevin and I headed out extra early on Saturday to run in the 10k. I have the best husband ever – he stayed with me the whole time. 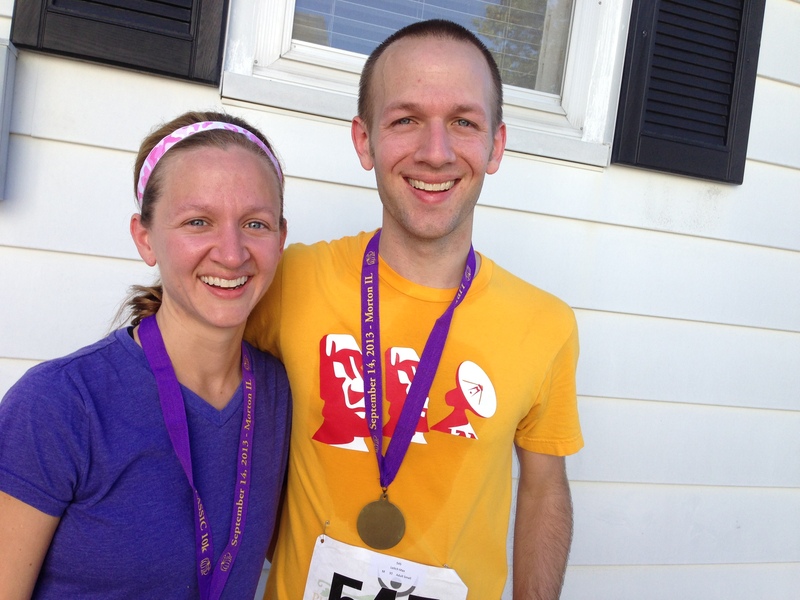 Even though he can run way faster than me – he knew I would need the encouragement towards the end. My friend, Susan, ran with us for quite awhile too – which was totally fun to catch up a little. (I just need to add that after the run, we walked a mile back to my parents and then had to walk a mile to the parade, and under normal circumstances we would walk a mile back – all after running 6 miles). We headed to the parade. The girls were pumped! The sky was looking a little overcast at this point but the rain was supposed to hold off until afternoon sometime. 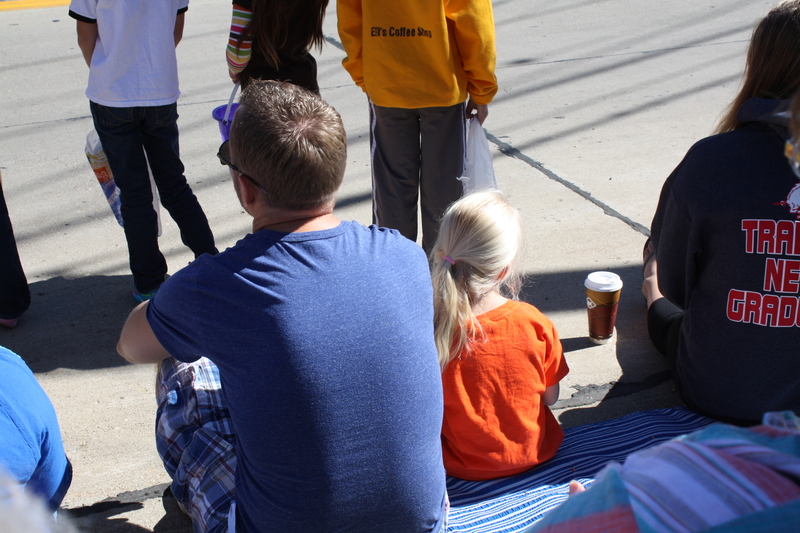 We sit about at the halfway point of the 2 mile parade at my great aunt and uncles house. My brother lives right behind where we sit. Before the parade actually started, it stared sprinkling. It would stop and then start again. Then as the parade started – it started raining harder and harder. The parade starts with the American flag, the parade Grand Marshall, the high school band, high school and junior high cheerleaders, junior high band, and then all the floats, politicians, local businesses etc. Before the junior high band actually made it to us, it was blowing and pouring. I mean POURING. Daphne and I ran for cover at Max’s house with Max and Contessa. Then a few minutes later Kevin and the girls (and my sister, her boys, Denise, Alex and Rick) come running and they are soaking wet from head to toe. 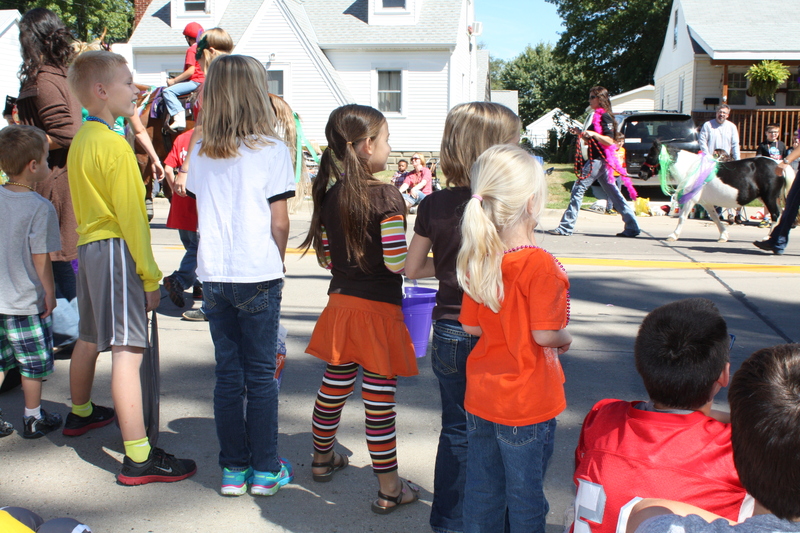 The parade was cancelled – I guess they started turning everyone in the parade around at the closest street. We had lunch at my grandma’s and then once the rain stopped, we headed downtown for some festival fun. 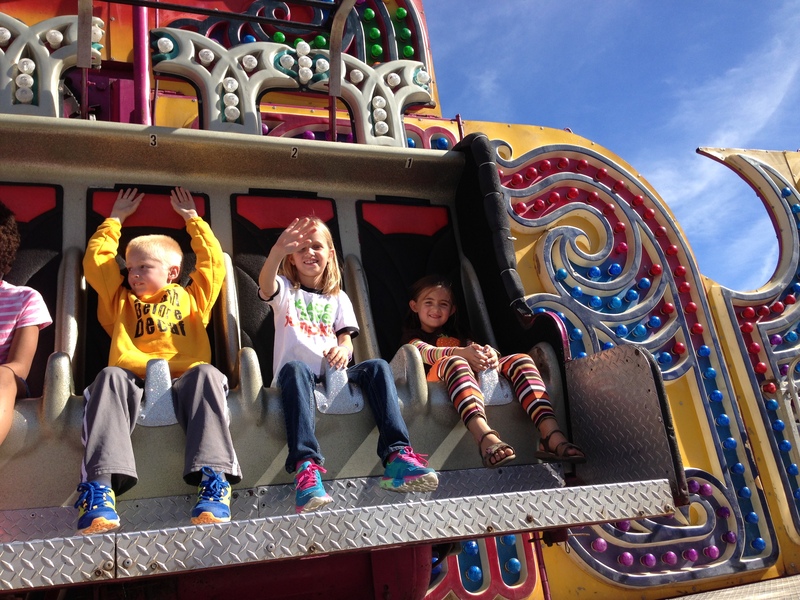 The kids rode rides and ate some great food – pumpkin ice cream and elephant ears!! That’s right, folks. That is a pumpkin. 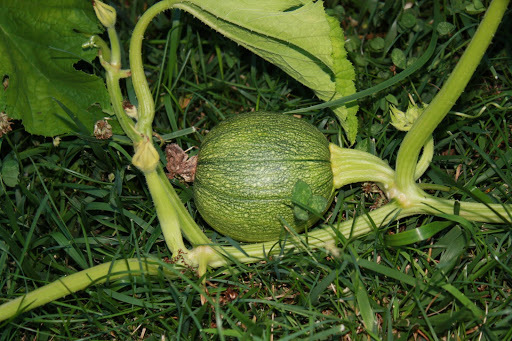 Having grown up in the Pumpkin Capital of the World, I am pumped that we have a pumpkin growing. Maybe we could take ours back to Morton and win the weigh off. Although I may be getting ahead of myself since our pumpkin is about the size of a baseball!! A girl can dream. . . . .
Kevin and Lucy are at the Pumpkin Festival. Daphne, Norah and I are not – we are all sick. I have been pretty miserable since Thursday and Daphne and Norah have been miserable since yesterday morning (EARLY morning for Norah). We have all had coughs, green snotty noses, fevers, etc. Bleh – no fun at all. After 18 months of no breathing treatments for Norah, we are now doing them every 4 hours. Lucy was actually the first one to get sick and the first one to get over it. Actually, she still has a little cold, but that may hang on for a while. My mom was in town for a couple of days this week, so on Thursday Mom took Lucy home with her – assuming we would all be coming up on Friday. 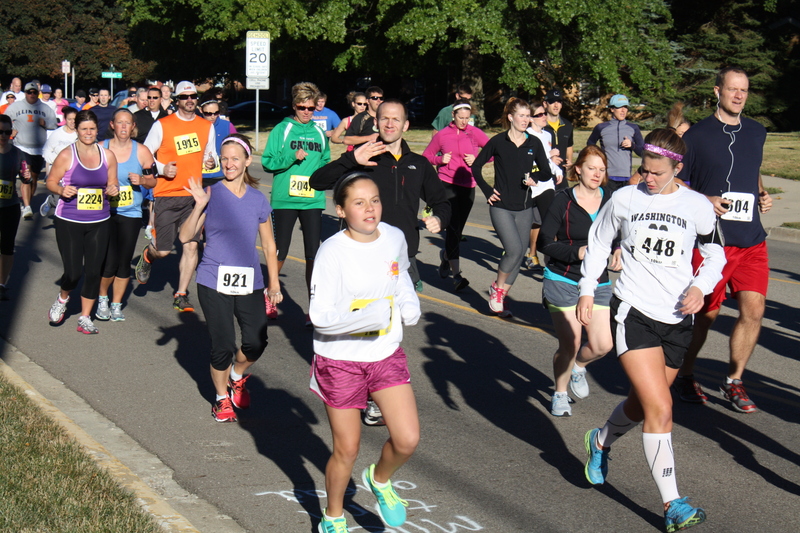 Kevin had signed up to run in the Pumpkin Festival 10k, so he decided to go up last night, run this morning, take Lucy to the parade and then head home after lunch. Let me just say that Norah has sobbed over the fact that she didn’t get to go. To people like me, the P-fest is a HUGE deal. I mean if you are from Morton, the pumpkin capital of the world – it is a part of who you are! I think I have missed twice – that’s it. This makes the third. It is not as big of a deal to Kevin – since he didn’t grow up in Morton. However, after 9 years of marriage – I think he is learning. It is a HUGE deal to Norah. She has been talking about and couldn’t wait to go! My mom bought shirts for the girls to wear while we were there. Norah seems like she is starting to feel better. 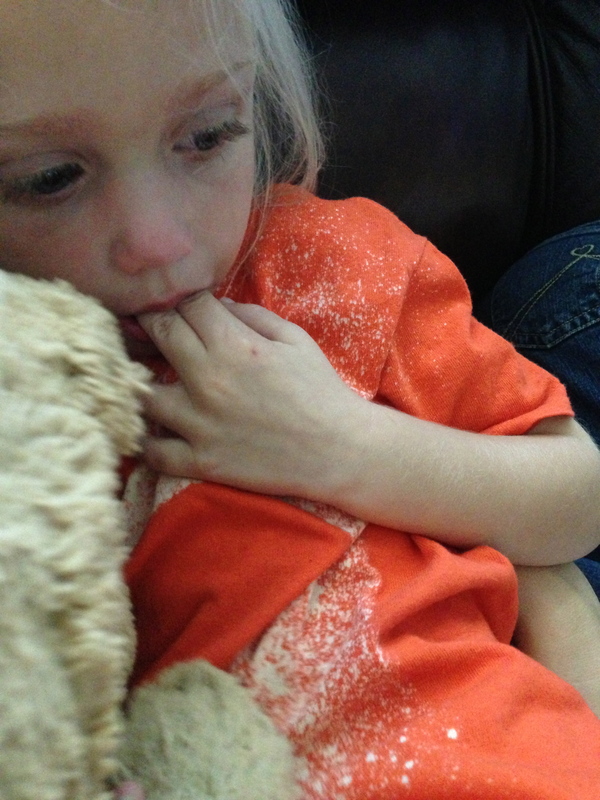 We will keep up the treatments until the cough goes away, but poor Daphne seems sort of miserable today. She slept well last night, thankfully, but her nose is running, her eyes are puffy, and she is just sort of fussy.